Jeffrey is a Quaker Parrot also known as a Monk Parrot. 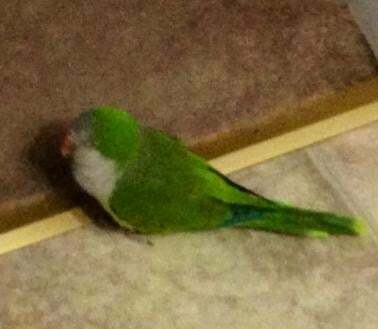 He has dark and light green back feather and wings with a gray underbelly. Jeffrey was lost from Howard Street and N. Terrace Avenue, Mount Vernon. He was last seen on January 19, 2014 at N 10th Avenue & W. Lincoln Avenue eating from a bird feeder. He does talk and usually answers to his name, even though when I saw him on January 19, he would not answer me back when he was spoken to. 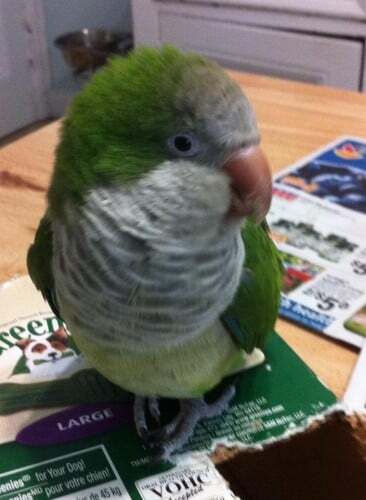 If you have seen a green Quaker Parrot in the Mount Vernon area please phone me urgently on 914-760-4419. Please SHARE Jeffrey’s profile to your social media pages using the buttons below, thank you.